Come fish the White River for trophy brown trout. Have you ever wanted to learn to fly fish? Our super affordable Fly Fishing School is coming up on Aril 12, 13 & 14, 2018. Two and one-half days of instruction, 2 nights lodging and all of your meals for only $495. Find out all about it by clicking here! My focus is for this page to provide you with exceptional White River fishing information. I would like to use my experience gained from fishing the tailwater trout fisheries of Arkansas since 1978 to provide you with accurate information and techniques needed to successfully fish the White River. I believe that anyone considering this destination deserves an accurate description of our fishing. Trophy fish cannot be guaranteed. If they could be, then there would not be anything special to catching one. The White River does deliver many trophy browns in the four to five pound range, with some of fish in the teens, and a few in the twenties. The river holds brown trout that are in the thirties and maybe forties, but they are rarely landed. Catching large fish usually requires patience, perseverance, skill, and a little luck. . Are we the least expensive guide outfit on the river? No, but you can expect more because the owner will be your guide. Like most things in life, you get what you pay for. My passion for making your day on the river the best, is my goal everyday. All gear is provided. If you want to wade while fishing, you need to furnish waders. Custom Deli lunches are available for $ 12.00 per person upon request, with a 48 hours advance notice. *3 person fly fishing trips are not recommended unless at least one angler is of intermediate skills. Both of these rivers are managed by the Arkansas Game and Fish. The abundant nutrients found within this watershed allow its trout to grow at astonishing rates of up to 1” per month. The river contains trout concentrations of up to 4500 fish per mile. That’s a lot of fish, growing really fast! The two rivers are managed pretty much the same with the exception that the North Fork River has a much larger percentage of the river set aside as “Catch & Release “ areas. Since the North Fork River is only 4.9 miles long in Arut fisheries. This is accomplished in two ways. Some areas are set aside as “Catch and Release” areas, where artificial lures with barbless hooks are the only method of fishing allowed. All fish, regardless of size, caught in a Catch & Release section must be immediately returned to the water. Outside of “Catch and Release” areas, a harvest regulation of a minimum size of 24” is set on German Brown trout, with a limit of one. This size restriction pertains to the entire lengths of both rivers. Any brown trout caught that is less than 24” must be immediately returned to the water. A good percentage of our brown trout are wild. When being guided by me, all brown trout will be photographed and measured if you desire a replica mount, then released after taking the utmost care of the fish. Rainbow Trout, Brook Trout, and Cutthroat Trout are managed basically as “put and take” fisheries. While this doesn’t sound very romantic, it is the way it is. The advantage of this is the rainbows provide a lot of action. Rainbows are much less cautious than browns and they are much easier to catch and that means that when the fishing is tough you can still come up with some fish, and everyone has a good time. The Brook Trout and Cutthroat Trout are stocked in muchlower quantities than the rainbows and provide the ability to catch all four species of trout in one location. This is not to say that big rainbows, cutts and brookies don’t come along, but it is much more infrequent than trophy browns. I realize the above description of our fisheries management is very general and leaves out the many nuances of fisheries management, but it gets the point across. Both the White river and the North Fork River are tail waters. What is a tail water river? Before the dams, these rivers were some of the best smallmouth fisheries in the U.S. There is a great history of the fishing float trips taken by thousands beginning in the late 1890’s. To mitigate the loss of the business generated from the White River smallmouth fishery the federal government promised to forever provide trout for the cold water rivers that now exist. It should be noted than for every dollar the federal government puts into the White and North Fork River stocking program, there is $5.69 in federal tax revenue generated. If half of the federal programs were that successful, there would be no federal deficient. Trout fishing is a huge source of income to Arkansas. These rivers are cold water because the dams release water from the bottom of lakes while generating electricity. Since electricity cannot be stored, the water levels of the rivers change as power demands fluctuate. It is not uncommon for the water levels to change 3 to 7 feet in a few hours time. While this seems very radical to fishermen, it is just another day in the life of a White River trout. The trout in our rivers can be caught at any water level, you just have to understand the techniques. Water depths and current speeds fluctuate greatly given the amount of generation coming through the dam. Water levels can vary by 3 vertical feet in minutes and 7 vertical feet in the course of an hour or two, but that is not usually the norm. Usually in a 24 hour period the water levels will vary by 2 -5 feet. These variances are greater and happen faster the closer you are to the dam. As you move further away from the dam, the existing flows drop, or “tail out” at a slower rate. Likewise the increasing flows have time to spread out as they come down the river making the rise of water levels not as dramatic. The rise or drop will still be the equivalent if you were stationed closer to the dam, it just takes anywhere from a few minutes to a few hours longer to reach those levels, depending on how far downstream you are. The dam’s current generation, what the last change was and when it occurred can be accessed anytime at 870.431.5311. More info. coming soon. There are several websites that provide monitoring on the dams’ water releases to produce hydroelectric power. By accessing 5 to 6 different sites’ information, and understanding the Corps of Engineers water management plan of 1998, you can become fairly proficient in guessing what the water releases will be. If you really want to learn how to do that just email and I’ll fill you in. If you want to know what’s happening right now, call or email, and I’ll fill you in. We are located 5 miles below the confluence of where the North Fork River enters the White River. The fresh renewing of cold water from the North Fork River keeps our waters cold enough for the trout in our section of the river to remain very healthy, even though we are 45 miles downstream form the Bull Shoals Dam, we are only 10 miles downstream from the Norfork Lake Dam. We are always surprised by the number of anglers who don’t realize that great trout fishing is available downstream of the first 20 miles below Bull Shoals Dam. While the upper sections of the White River do have great fishing and I guide in those areas frequently, but I catch just as many fish down river in our section. What’s different about our section of the White River. It is much less developed. Yes, you’ll see a few houses, but you’ll also notice that 90% of the banks are forest or empty pasture. For many, this is more enjoyable than looking at one house or resort after another like those that line the banks of the upper river. There are a lot fewer anglers. There are a lot fewer boats. There are as many trout per mile per angler as anywhere on the river. This equals to the same fish catching experience without the crowds of the upper White. What do the rivers look like & what are the most common lures used? The White River is a big river. 75 to 200 yards across with it’s trout waters stretching for 90 miles. It has shallow riffles, deep fast runs, and deep holes. The bottom can be moss or grass covered, clean gravel or solid rock with many ledges and fractures to hide big fish. The White River fishes like a big river. Meaning that you have to break it down into sections that hold feeding fish and those that are as empty of fish as a WalMart parking lot. The North Fork River is much smaller than the White. It averages 35 -50 yards across and at low water 80% of the river can be waded. The North Fork tends to have low water levels more often than the White River so it is popular with fly fishermen, who enjoy wading. More coming soon. Artificial Lures That Work More coming soon. These lures in the colors shown are consistent producers. The legendary Rapala Countdown® lure was introduced back in the 60s and is still included among the favorites of professional and casual anglers alike. The gravity defying body of the Countdown sinks, at a foot per second, to your desired depth allowing you to repeatedly reach and retrieve without rising out of the strike zone. With this lure, you can find fish quickly and consistently throughout the water column, whether they’re at the weed tops or holding bottom. My preferred sizes are CD07 , CD09 & CD11 . Rapala’s Husky Jerk® series boasts some of the most universal fish-catching lures ever designed. The finely tuned balance of these lures mean that they can be cast or trolled at any speed and run true. The beauty of the Husky Jerk is that it works so well in so many situations—off sunken islands or rock points, whether fish are holding deep or up on a shallow shelf, or in warm or cold water. The angler controls the speed and action of the bait depending on the target species and situation, and the Husky Jerk does the rest. My preferred sizes are HJ10 and HJ12 . Rapala Scatter Rap’s patented Scatter Lip™ is the secret to the evasive movement that draws strikes like no other lure out there. Every Scatter Lip is specifically designed to match the size, shape and profile of the bait for maximum action. This, combined with a wide variety of body shapes and colors makes the Scatter Rap series a must-have lure in every angler’s tackle box. Baitfish skitter and scatter when they are pursued by predators – it’s this erratic and evasive action that triggers the strike. Made of balsa, with a custom Scatter Lip, the Scatter Rap® CountDown® consistently swims with that erratic and evasive sweeping action – perfectly mimicking vulnerable baitfish. Slightly weighted, this gravity defying body sinks, at a steady rate, to your desired depth allowing you to repeatedly reach and retrieve without rising out of the strike zone. Casting or trolling, the Scatter Rap® CountDown® is the perfect choice for any species of gamefish. My preferred size: Well they only make one size! I wish they would make it in a 5″ version. The Rapala Original Floating® lure is the one that started it all and is still the number one “go-to” lure for anglers worldwide. Like all the lures that came after it, the Original Floating lure is hand tuned and tank tested to ensure that it swims the same as the very first right out of the box. It’s reliable, versatile, effective and best of all, irresistible to game fish. 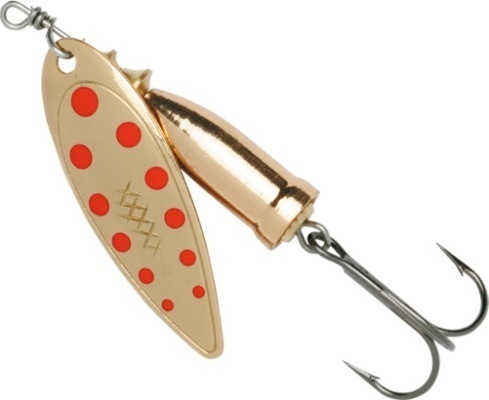 The wounded minnow action of this lure is guaranteed to catch fish. It can be twitched on the surface, retrieved as a shallow runner or weighted for targeting deeper depths. The Rapala Original Floater comes in a variety of colors and sizes to cover any angling situation and to target different species from panfish and bass, to trout and musky. See for yourself why the Original Floater is acclaimed by anglers as the most versatile lure worldwide. My preferred sizes are 07 , 09 & 11 . Deep running blade (willow leaf shape) in 1/4 oz. These in-line spinners are a go-to lure when you want to catch large numbers of fish. Rainbows love bling! I’ve found that the colors above pretty much are all you need. Mid-depth blade in 3/8 oz. and 1/4 oz. I’ve fished this river since 1978 and have guided on it since 2004. It has been my experience that for trophy browns the White River fish’s best in the cool or cold weather months. Being located in northern Arkansas our winters are rarely extreme. While we will have very cold days that occasionally reach into the teens, they only last for short period before we are back up in the 40’s &amp; 50’s. Snow may come 4 or 5 days a year and is usually light. fish is possible. Some of the best trophy fishing occurs in mid October to the end of November, then againfrom mid January to mid March. The first period coincides with the migration of brown trout upstream to spawn and the second period is after the spawn when the fish areputting weight back on after the spawn. The second period in January to March is when we can have what is locally known as the “Shad Hatch”. Obviously this is not a hatch, but a time when shad located in the reservoirs above the dams can be susceptible to quick drops in temperatures as cold fronts move across the region. The stunned, dying or dead shad are swept through the dams electric generation turbines and flushed into the river below. It’s like someone yelling “Free steak” at The Outback Steakhouse. The fish come from miles to gorge on the shad. At the beginning of this feeding frenzy the fishing is easy. As it progresses the fish learn that all that looks like a shad, is not a shad. This is when each guide seems to have their own tricks and patterns to continue to fool the fish and keep the bite coming. This event happens most often below the Norfork Lake Dam, but is usually more of an big event when it occurs below Bull Shoals Dam. Can this be predicted? No, not really. It requires a combination of weather conditions and the dam generators running hard enough to pull the shad through to the river. Is it worth jumping in the car and coming with a moments notice…ooohh, yes. When the action is hot during the shad hatch you will pull your jig away from 3 lb. plus fish, because they are the little ones. Fishing for trophy browns More coming soon. Why would you even want a guide? Since our rivers are tail waters and subject to frequent changes of water levels, you may want to gain some “on the water” insight as to how this affects the fishing, wading and boating experiences of the river. Even if you decide not to hire a guide for these reasons, stop by a fishing shop or call a guide and discuss this with them, it will help you catch fish and help you to have a safe day on the water. You are in the area for the first time and don’t know the techniques and types of water that hold the big fish, or the higher concentrations of fish. You’ve come prepared to wade, but water levels won’t permit it and you are not comfortable renting a boat and navigating the river yourself. So you hire a guide to handle the boat. You know how to fish, but want to maximize your time fishing, not looking for the next spot. You know how to fish, but want to spend time focusing on your spouse, children, grand children, friends or business client. You want to sharpen or acquire new fishing skills, fly casting skills, different fishing methods, or even boat handling skills. One who works hard to deliver what you ask for. You can find really good, competent fishing guides on our rivers. This area has guys that you will regularly see on the television fishing shows, innovators of fishing gear, fishing authors, some who have spent their entire lives within the fishing world. Some of these were born here and some came other points around the globe. I love to fish, but even more, I love to guide people and see them catch fish. I have an open mind that and I’m observant,and those traits allows me to learn more everyday. I’m polite and professional. I will match your fishing skills to techniques that will catch fish. If you desire to learn more, we will start with where you are at and work to develop the skill you are interested in acquiring. If I can’t provide top notch instruction for the skill you want to develop, I’ll recommend a guide who can. Something that is unique about my guide service is I offer both fly & spin fishing trips or even a combination spin/fly trip. Look over several different guides’ websites, call a few of them, and choose a guide that you think you’ll enjoy a day on the water with. The following might be some good questions to start a general conversation. How long will we be on the water? What is the exact cost, what is included, and when is it expected? What type of payment options do I have? Are you expecting a tip? What, if any tackle, food, and drinks do you provide? What type of boat is being used, and how old is it? Do you teach me to fish, or just take me fishing? Do you (the guide) fish on the trip? Do you Practice Catch and Release? Can I keep a trophy fish? Are you a full, or part-time guide? Do you have a Guide License? How has the fishing been lately, and what can I reasonable expect? When was the last time you were on the body of water we will be fishing? Who removes the hook from the fish that we catch? Where do we meet, and how do I get there? If water levels permit, do you allow me to wade? Trips are a combination of wade and/or boat trips depending on the water levels, your preferences, and physical condition. I guide in all weather conditions that do not have an element of danger. With over 60 miles of water available we can nearly always find a location that presents good fishing conditions. Graphite rods make wonderful conductors of electricity and we don’t want to get caught in a tornado, but a little snow, rain, and wind doesn’t hurt much and the fish don’t seem to mind. Any canceled trips will be at the guide’s discretion with safety given the highest consideration. A trip may be postponed, interrupted or even canceled if conditions are unsafe. Interrupted trips are pro-rated by time. I began fly fishing in 1978 and that is the way I enjoy fishing now, so primarily I guide fly fishing trips. However, many of our customers who stay in our lodging do not fly fish and to accommodate those I offer a combination of fly & spin fishing on a trip. This is quite a bit different from many fly fishing guides who just fly fish. Spin fishing is easier for a lot of people and allows for many more people to enjoy catching these great sport fish. A cap with a bill. Subtle, earth toned clothing, especially if wading is an option. These fisheries are stocked with rainbows in quantities that require the harvesting of a high number of them. I’m all for “Catch & Release“ practices of fisheries managed for that , but for rainbows in the White River it is not expected and will simply result in an overabundance of fish and less food all the fish, therefore you are welcome to keep up to a legal limit of rainbows. Since our brown trout are managed differently, I release all brown trout, even those in excess of 24”. Pictures and measurements can be recorded and replica mounts are superior in every way to original skin mounts. We offer a $ 50 contribution toward your replica mount of a trophy brown trout in excess of 24”. Coffee and water are furnished on all trips. Deli lunches are available for $ 8.00 per person upon request with a 24 hours advance notice.Something unique about my guide service is I offer light tackle spin fishing if you have a fishing companion who doesn’t want to fly fish. All boats are premium 20 foot AFF’s, one of the most stable river boats manufactured. Engines are 20 hp Mercury outboards with jet drives. So you have no prop to ruin. In 11 years we have not experienced a single damaged lower unit. We are the only outfitter I’m aware of renting jet drives. Plus whatever gas you use during your rental. Rental includes 4 seats, paddle, life jackets, net, drag chain, & anchor. basis only and are usually float/wade combination trips. Buffalo River trips are conducted on the lower portion of the Buffalo River and can be combined with White River trout fishing trips. fertile and oxygenated water allows for an astonishing 6,000 fish per mile in the ½ mile creek. Not only are there a lot of fish, they can be huge! This is the perfect place to teach a beginning fly fisher how to fish moving waters. Casts are short and easy and they can concentrate on perfecting the drift, strike detection, hook set, and fish playing skills. These fish are not exceptionally easy and you have to use the right flies & techniques. Just ask how to fish it and I’ll explain it all, or you may opt for a guided trip for your young angler.